A good ripe pineapple has much richer flavor and sweetness than the canned variety. Cutting through the hard, bumpy skin (not to mention the unedible core) of a pineapple can seem like a daunting task. In reality, there is a very simple method for peeling a pineapple that will leave you with the best, juicy fruit. When shopping, choose a pineapple that has firm, gold to brown skin (not too green) with green, loose leaves (not brown or wilted). A ripe pineapple will have a strong, fresh pineapple smell. To peel the pineapple you will need a long knife. Twist or cut off the leaves and about a 1/2 inch of the top and bottom of the pineapple. If you like, you can use the top and leaves as part of a table decoration. Turn the pineapple upright onto its base. Notice the dark brown "eyes" around the edge of the pineapple. These run lengthwise through the pineapple and have a very unpleasant taste. Place your knife on top of the fruit just behind one of the eyes. The eyes run down the side of the pineapple in a column. 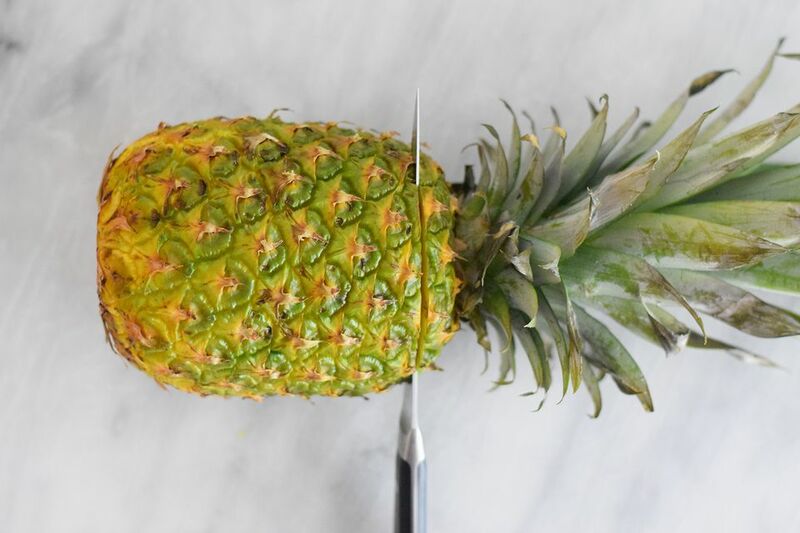 Slice down to the bottom of the fruit slightly turning your knife at the top and bottom to follow the curved shape of the pineapple. Stay close to the "eye" so you don't waste too much good fruit. The first cut you made will be wider than subsequent slices. Notice the rows of eyes on each side of the cut. Cut off the rest of the pineapple skin by slicing down from top to bottom along each row of eyes (as revealed by your first cut). Your knife should be behind the eyes at approximately a 45-degree angle. Don't try to cut off too much of the peel at once or you will take a lot of good fruit with it. Once you have completely peeled the pineapple, check the fruit over for any skin or eyes you may have missed. Remove any remaining eyes with a paring knife. If you wish to slice the pineapple into rings, remove the core with a pineapple corer and slice to desired thickness. Alternatively, slice the pineapple into rings and remove the core from each ring with a paring knife. If you desire to cut the pineapple into wedges or chunks, first cut the pineapple into four sections. Cut straight down through the center core and then again through the center core of each half. Place the quarter section of the pineapple core side up. Slice away the core by cutting lengthwise just under core. The core is easily distinguishable from the edible fruit because it is lighter in color and fibrous in texture. Repeat with remaining quarters. Once the core has been removed, cut the pineapple into desired sizes. To store, place in an airtight container and refrigerate.